Effect of compactness of notation on cognition? I vaguely remember reading somewhere that one of the reasons that the Romans failed to make any mathematical achievements is that their number system is illogical and does not lend itself to trivial observations that the Arabic (or Indian) numeral system allows. Similarly, the increasing compactness of modern mathematical notation allows increasingly complex thoughts to be written down and processed with much greater ease (the only downside being the increased required background knowledge to understand the notation). I also remember reading somewhere that the reduction of Maxwell's 20 differential equations to 4 has greatly improved physicists ability to think, so much so that even a physics grad student today is able to have complex thoughts that even Newton was not capable of having, purely due to compactness of notation. Actually, I think the source said that the reduced set of equations emphasized the parameters that physicists normally cared about - I forgot exactly what it said. Are there any studies or books on this? I've been searching and trying to find the sources where I got these informations from but to no avail. If I recall correctly, in his book "The number sense", Stanislas Dehaene says that one reason Chinese have better than average math skills is because all digits have only 1 syllable and the number of syllables increases linearly with the number of digits (vs. for example the horrible seventy-seven in English). If I still remember correctly, he cites some studies about that. It's not exactly what you asked but that's definitively a reference relevant to your question. Your hypothesis is not quite true. Even if we restrict discussions to numbers only, conciseness (the term used in literature for your "compactness") is not the greatest for the Western system; the Georgian number system is superior in this respect. I'm reproducing the following table from Chrisomalis' book (p. 391). i.e. the Georgian one is always the most concise (for the same base). 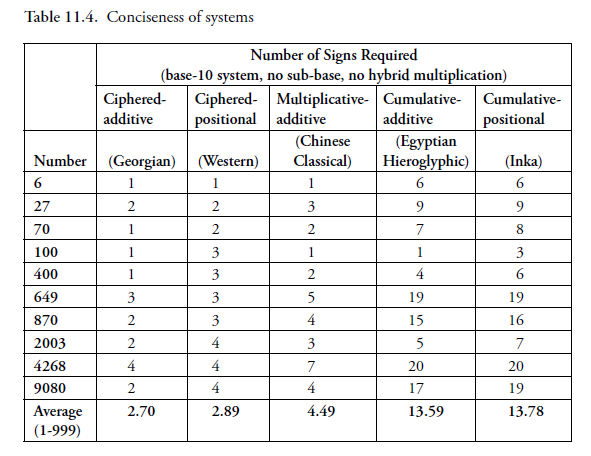 So the ciphered-additive ones do rank worse than ciphered-positional on the sign count aspect. And to make this answer a bit more self-contained, instead of the Georgian system (whose symbols I cannot type), I'll reproduce here the Latin alphabetic numerals, which were briefly used in Western Europe in the 12th century. So, for example, to write 101, you write ta in this system. Not the answer you're looking for? Browse other questions tagged cognitive-psychology mathematical-ability cognition or ask your own question. What is the meaning of semantics to cognition? 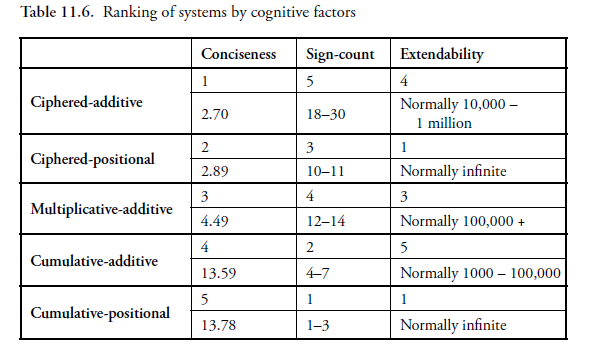 Models of complete internal world of human cognition?